Four Things You Should Know about Food Allergies - Doctor Hermann M.D.,P.A. Do you suffer from food allergies? If you do, you are definitely not alone. Millions of Americans, including as many as 1 in 13 children, struggle with food allergies on a daily basis. A food allergy is defined as an unpleasant and dangerous immune system reaction after eating a certain food. Though some are temporary, others last for life. Even if you don’t personally have a food allergy, a friend, family member, or even your own child could have one, so it’s important to understand these four things about food allergies. A food sensitivity is definitely frustrating, but it’s not as dangerous as an allergy. Food sensitivity occurs when the body experiences discomfort from certain foods, like people who get stomach aches after eating dairy or wheat. But a food allergy can cause life-threatening reactions like the inability to breathe. People who have very severe food allergies can experience something called anaphylaxis, in which even one small bit of a food, like cross-contamination from peanuts, can constrict and tighten the airways, cause a rapid pulse, and make it difficult to breathe. This can lead to a coma or even death if not treated immediately. Food allergies can be diminished in a manner similar to a vaccination. Known as sublingual immunotherapy, this treatment provides a patient with a small dose of a specific allergen under the tongue in order to boost the body’s tolerance to the substance. Over time, this can help make a food allergy less severe. 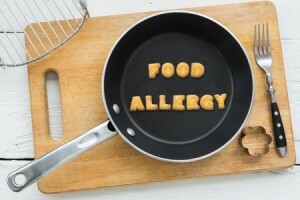 A food allergy often makes itself known with signs like tingling or itching in the mouth, hives and eczema on the skin, swelling of the lips, face, tongue, or throat, wheezing and trouble breathing, severe abdominal pain, and dizziness or fainting. These symptoms are most likely to develop within two hours of eating a trigger food.